In the market, there are lots of software which can be used to convert PDF to PowerPoint but some times you may claim that the output pptx file can not be edited like the normally pptx file, why? Normally speaking, there are two kinds of PDF file, one is text based and the other is image based. When handling text based PDF file, it is quite easy. However, when converting image PDF file, the OCR technology is pretty necessary. In this article, I will introduce software named VeryPDF Table Extractor OCR which can be used to convert scanned,normal PDF or image file to PPT, CSV, XLS, XLSX, HTML, etc taking the OCR recognition technology. Meanwhile, it supports more than 30 languages. In this article, I will take a random PDF file for example to show you how to convert the PDF to pptx. Please check the input PDF file and the output pptx file in the following snapshot. We can not deny that in the output pptx file, the format and the layout in the PDF file can not be retained. But the accuracy in recognition can reach 99%. If you are interested in this software, please follow my steps to run the conversion. First, download VeryPDF Table Extractor OCR. After downloading, one exe file will be shown in the down folder. Double click it to install this software following the installation message. Once installation finishes, there will be an icon on the desktop. Simply double click its icon, then the software can be launched. The following snapshot is from the software interface. Second, run the conversion from pdf file to pptx. 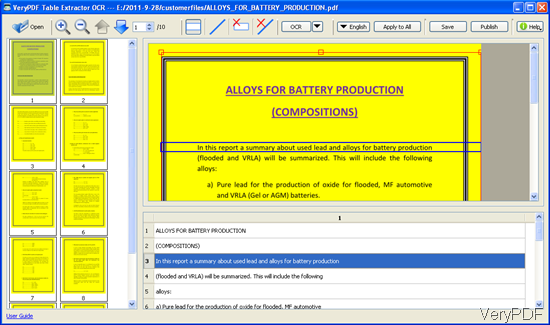 Add PDF file to this software can be processed by dragging & dropping. Then the PDF file will be shown on the software interface. In some degree, this software can be used like PDF reader. According to the PDF content, please choose the corresponding language. Draw a rectangle to the area where you need to be recognized in the output PPTX file. Click the button OCR then the conversion will be run at once. If you feel somewhere has been recognized in a wrong way, you can correct it in the following blank then save it as pptx. Up to here, the conversion can call an end. During the using, if you have further question, please leave a comment here or contact us by the ways supported on our contact us website. This entry was posted in Table Extractor OCR and tagged pdf to pptx. Bookmark the permalink.